I’ve been cooking a bit of Indian food lately, inspired by Vaishali’s vegan blog over at Holy Cow. Full credit goes to Vaishali for this recipe, which I have reproduced faithfully (slightly Australianised) because I enjoyed eating this so much. It took only 6 minutes to cook the dhal in a pressure cooker, and another few to fry the seasonings, meaning I had it ready in the time it took to cook the rice. It is made with channa dhal, which I have never used before. It looks like slightly large, slightly more yellow, split peas. It is, in fact, a kind of small chickpea, skinned and split. It is slightly nutty in flavour. I got mine at a local Indian grocer. Of course I tweaked it, not for my usual reason of being an unrepentant tinkerer with recipes, but because I didn’t have any raisins. Actually I did, but couldn’t find them, a SURE sign I need to tidy my cupboards. Instead, I substituted them with dried cranberries, which I think worked really well with their sweet, tart flavour. The final dhal was delicious, although perhaps a little sweet for my liking, so I might be inclined to reduce the sugar next time. I ate it with some rice. 3-4 slivers of fresh coconut (optional). 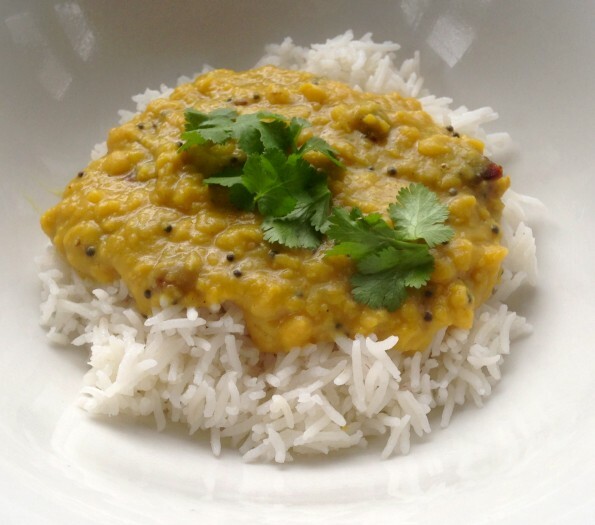 In a pressure cooker or in a saucepan, combine the dhal with bay leaves and turmeric. 1a. If using a saucepan: cover the lentils with an inch of water, bring to a boil, and let the lentils cook at a simmer, covered. Check frequently to ensure they don't dry up and add more water if needed. Cook the lentils until they are really soft and tender. 1 b. If using a pressure cooker: add 3 cups of water to the 1 cup of dhal, bring to high pressure, and cook for 6 minutes. In another saucepan, heat the oil. Add the mustard seeds and, when they sputter, add the cloves, cardamom and cinnamon. Saute a minute until the cardamom looks puffy, then add the slivers of coconut, if using, and saute until they get lightly golden brown. Add the raisins and ginger, saute for 30 seconds, then add the cooked dhal. Stir well to mix. Add some water if the dhal is too dry. You want it to have a thicker consistency than most dhals do, but not so thick that it's dry. Add the jaggery (i used brown sugar) and coconut milk and heat the dhal through. I know that Indians like their sweet desserts but I never really knew it extended to savoury dishes as well. 🙂 I do like discovering the range of dhal that can be made so I will continue my exploration.